Together these two well-known writers have managed to explain in simple terms the very complex subject of race, discussing in detail genes, cells, chromosomes, and blood. Here is a selection of chapter titles to give some idea of the scope of the book: The Mystic Word “Race”; What Races Are Not; Skin and Bones; Through the Microscope; From Parent to Child; The Rules of Inheritance; Rules Can Be Broken; The Telltale Blood; Races at Last; The Present and Future of Race. John Bradford’s clean-cut diagrams will help to make some of the more difficult parts of the book clearer; the additional maps supplied by Dr. Boyd are also extremely helpful. Asimov’s third non-fiction book is, like his second, a distillation of a work by somebody else, in this case his close friend from Boston University, William C. Boyd. Curiously, unlike much of his other early non-fiction, it has not aged particularly and is therefore especially undeserving of the obscurity into which it has fallen. The book is a scientific discussion of the nature of race for teenagers and goes far to puncture many of the myths regarding race which afflicted us in the 1950’s and continue forty years later. (It was only last night as I write this that I was reading a Newsweek article on the nature of race which made many of the same points as Races and People). 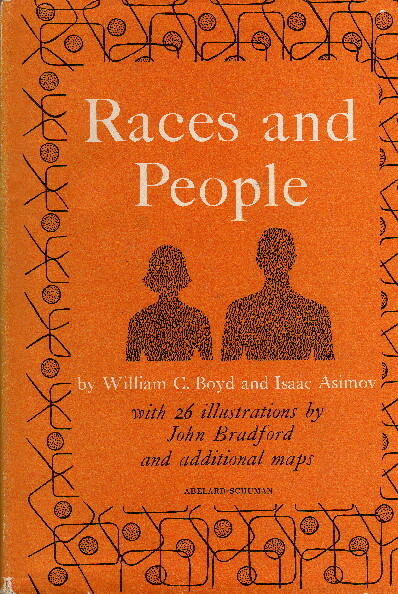 Asimov, as an unabashed liberal and champion of the essential value of any human being (partly because of his growing up as a Jew in an era when significant portions of the world found anti-Semitism innocuous or even virtuous), here attacks the notion of “race.” He shows how it is hard to define and uses Boyd’s research to demonstrate that the superficial characteristics which so many of us use to define race and determine our value vis-a-vis other human beings are utterly without value. In the end, again following Boyd, he resorts to blood typing as a method—not to determine race—but to trace the different overall “types” of humanity and show how they have moved back-and-forth across the world. On the other hand, it is curiously dated in one particular respect. People living in the United States who are of African descent are described as “Negroes.” As a child of the 1960’s, I can remember the efforts expended to dump this term in favor of “Blacks,” which has, itself, come under sharp criticism and been replaced by “African-American.” The merits of the argument over correct terminology are not mine to define, but it remains that this heritage of fifty years ago is jarring in a book which is otherwise as current as if it had been written yesterday.